After a very very long day yesterday i managed to have some sleep.Well few hours the least.With the changes of the time zones and my excitement I managed to wake up at 4am then 6am and both times i couldn't fall to sleep so i just finished editing my 45sec Show-Reeel which i couldn't finish the day before,because my eyes just couldn't stay open. So had a really early start today. Prepared all promo material i needed for the day and headed off to the festival.My plan for today is to go to the Short Film Corner and book a screening room for BLINDSIDE so we can officially say the the film Premiered at Cannes Short Film Corner as Part of the 65th Festival de Cannes 2012. BLINDSIDE World Premiere at Cannes Short Film Corner. 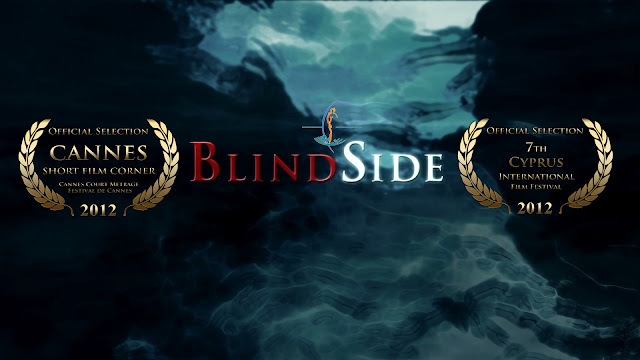 The Screening of BLINDSIDE at Cannes Short Film Corner is on 18th of May 2012 at 4pm. Contact Dimi if you want to book a seat here at Cannes Short Film Corner for BLINDSIDE World Premiere. If anyone present here at Cannes wants to see the short film leave a message or comment here bellow the post or message me on facebook or email me if u know my email.I will check all of those sites to see if anyone is happy to come to BLINDSIDE screening. Then i can get myself settled at New Zealand Film Commission Office right outside the festival.Lisa Chatfield and NZFC were so kind to help me and offer me a space for my to work from right next to their office.The space i am at the moment will be shared by another 21 New Zealand Film Makers including Zia Mandviwalla.Zia is the Director of Short Film Called "NIGHT SHIFT" which is competing at the Short Film corner as part of the competition section. This the look from the NZFC Office where i am at the moment. I am trying not to be distracted by the view i have from the NZFC Office here. So now is around 1pm here local time and i managed to put few of the promo material prints around the place for others to have a look. I am quite happy how much work i have done so far and i have another half a day to go so i will see what else i can manage. For now i have to re-organize/update my schedule because few other things came up. So cute and small and 100% Electrical.So cute. I wish i had time to go to the beach.Plus i dont have my beach gear.Well if i have time i can try to think of something. Managed to stop for half an hour and have some delicious French Pizza at New York Restaurant right next to the Festival Entry.Well 100m from it. I so want to watch this film.The original with Arnold Schwarzenegger was awesome. Omg, looks sooooo amazing...! Love the pics too! So looks like you're settling in okay, and what a view you have. Beautiful! Well, we're all thinking about you back here, Dimi, and wish you well my friend. Thank you guys.I will keep updating with whats happening.So much to do.The schedule here is very tight and its not possible to see absolutely everything.I wish i can be on few places at once. Love your blog about Cannes. Keep up the good work.